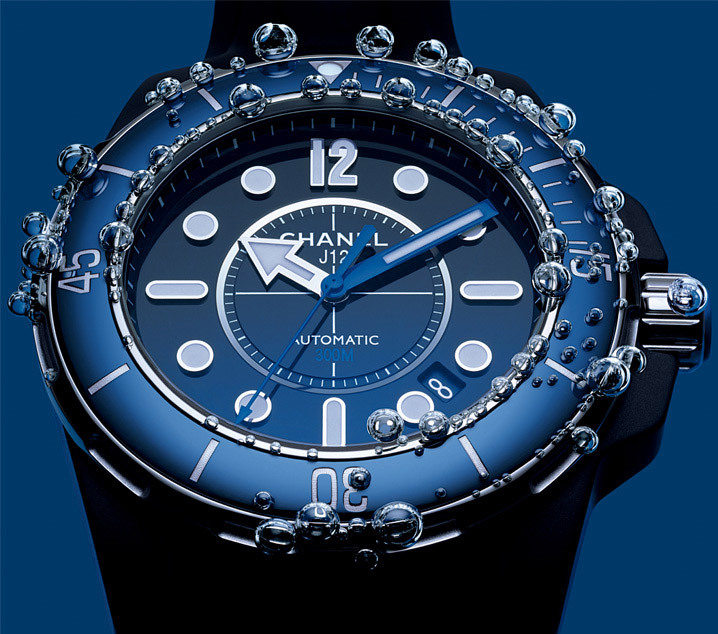 Diving is cool and to proof this, Chanel released earlier this year in March a Marine or dive version of their popular J12 watch, the J12 - Marine. How fashionable and stylish is that? There's a new player on the Rolex Submariner market. The watch is waterproof to 300 meters and has some cool features. It comes in three colours, although the official Chanel site only offers Black or Blue versions, there's supposedly also a white version out there. The case is 38 or 42mm wide and in black, blue or white. Still ceramic, the black and blue cases are bead-blasted for a matte, rather than shiny finish. Though the white version is still done with a glossy finish. The black with black bezel version is only available in 42mm and looks pretty cool. 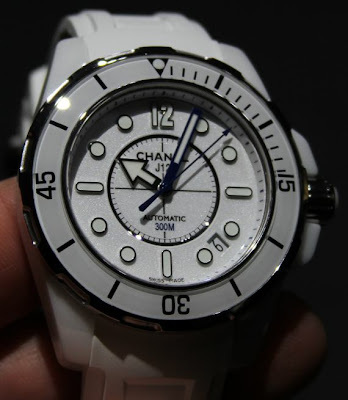 Strangely enough there are pictures out and about of a white version of the J12 Marine but as already mentioned, Chanel's website doesn't mention these. I wonder if they are some kind of limited version? The back plate has a fairly simple engraving which shows a J12 Marine text and some wave like looking lines. If you have an rough 5.000,-$ floating around, this watch can be yours. For most of the divers that I know, that amount of money will be rather spent on many things but not necessarily on a watch! Black high-tech* sand-blasted ceramic and steel case with --black rubber bracelet and blue bezel (38 and 42mm) or black bezel (42mm). White high-tech* polished ceramic steel case with white rubber --strap and white bezel (38mm). Unidirectional rotating steel bezel, engraved and equipped with a high-tech ceramic or sapphire dial (in blue or black) for easy reading of time under water. Luminescent dot at 12 o’clock acts as guide marker. Sapphire watch-crystal with a blue anti-reflective coating on the inside and outside (on the black version) or clear coating on the white model. Screw down steel crown with high-tech* ceramic cabochon equipped with a crown protector. Black or white lacquer dial. Hands, numerals and the numeral ‘12’ is luminescent for perfect legibility in the darkness. Resistant to a pressure depth of 300 meters (30 atm). Mechanical Swiss automatic movement (28,800 vibrations/hour). 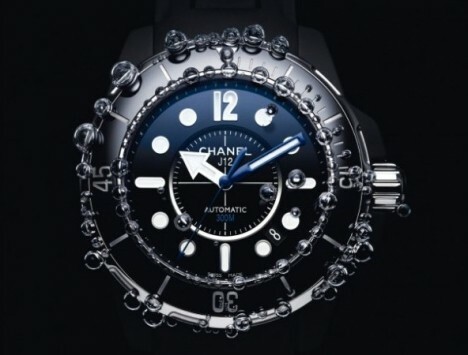 Functions: hours, minutes, seconds, date and time under water on the bezel. Matte rubber bracelet with openings allow water to be released --from the bracelet. Highly water resistant, shock resistant, light resistant, UV resistant composite material.